Let’s face it, traditional birth plans don’t work. Many providers hate them. They’re seen as too long, demanding, unrealistic, or negative. Studies have actually shown that in certain places, having a birth plan can negatively impact how staff treats you. Clearly something is wrong. We are here to reclaim what birth plans were meant to be: a concise, easy to read, positively-phrased list of your most important birth preferences. This is not ‘yo mama’s birth plan. “Healthy mom, healthy baby” is the old saying, and while of course this is ultimately what everyone wants, your birth story and your journey into parenthood matters. The process of birth and how families are treated during it can mean the difference between an ecstatic, blissful experience and a traumatic one. Many parents walk blindly into birth, trusting that their doctor or midwife “knows best,” only to find that their priorities weren’t in line with what their birth team wanted. Having a care provider who’s not on the same page with what’s important to you and not educating yourself about the birth process can be at least disempowering and at most, traumatic. Don’t wait until labor. Prepare yourselves now. This baby will only have this single birth experience. Time is precious. Know your options. Know your resources. At [M]otherboard, we are the “starting place” for your parent education journey. The web is an information overload, many times with very conflicting viewpoints. You can trust us to talk straight with you and tell you the benefits and risks for each decision you need to make. There’s no good/bad, black/white here. Every procedure serves a purpose, every procedure is a tool. You get to decide when and how to use those tools based on what’s going on medically and what’s important to you. Why can it be so hard to speak up during your birth? The hospital system and the way we see doctors as “authority figures” can make it feel uncomfortable to ask questions, no matter how valid they may be. 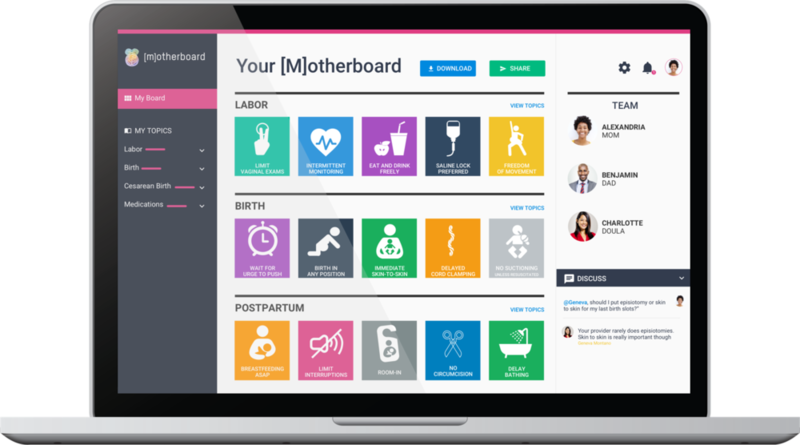 [M]otherboard helps you communicate with your birth team in a bright, clean, easy-to-read way while giving you strategies to navigate the hospital system.